Enter our raffle to win a new cookbook. For passionate cooks, few things are more inspiring than paging through the bright, smooth pages of a cookbook not yet splattered with sauce and oil. In need of some new recipe ideas? 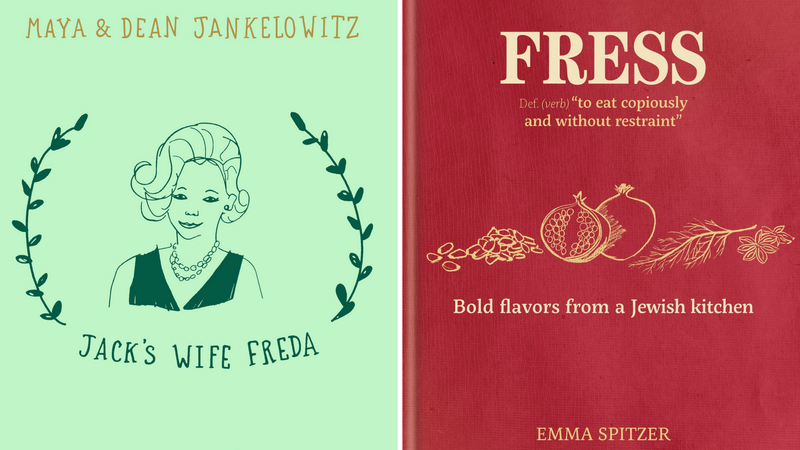 Enter to win Jack’s Wife Freda: Cooking from New York’s West Village and Fress: Bold Flavors from a Jewish Kitchen, two recently published cookbooks that are bound to be in heavy rotation this year. Between the minty green covers of Jack’s Wife Freda are dozens of recipes from the beloved pair of NYC restaurants that inspired the name of the cookbook. The recipes (many of them illustrated!) are full of Ashkenazi, Sephardic, South African, Israeli influences that emphasize the diversity found within Jewish cuisine. With this book, the authors make their most popular dishes — spiced beet dip, duck bacon, lamb kefta and duck tagine — accessible beyond the walls of their bustling cafes. Fress, written by the UK MasterChef finalist Emma Spitzer, similarly explores family heritage through food. Emma describes it as “Ashkenazi meets Sephardic,” a combination that’s catching on everywhere from NYC to Israel to Berlin. With recipes like challah, sumac chicken, salmon and sweet potato fishcakes, Fress (the title, as noted on the book cover, is Yiddish for “to eat copiously and without restraint”) is an unfussy contribution to the expanding canon of Jewish cookbooks. You can get a taste of what these books have to offer by checking out the recipes we published from the cookbooks: Green Shakshuka and Pastrami Filled Pierogis. Enter our raffle by Monday, May 1 to win either cookbook!